The Gainesville, Florida day trips and one tank trips described in Florida Backroads Travel are all within a 100 mile radius of Gainesville. We estimate that the average passenger car can go about 250 miles on one tank of gas, so these trips will get you there and back with a few gallons to spare. Here are some things to do and places to see within 100 miles of Gainesville. Winter Park home and studio of American sculptor. 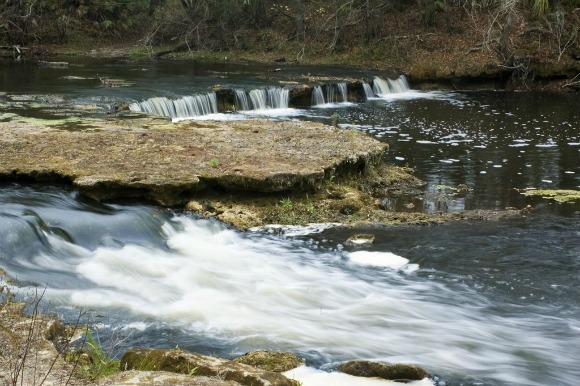 Ocala National Forest, canoeing, swimming, kayaking, camping. Fernandina Beach. You can ride on the Atlantic Ocean beach. Fees vary by selected ride and number of people. 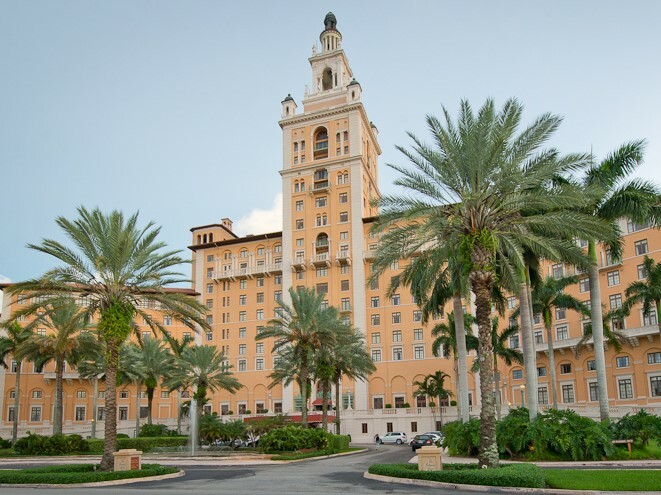 Ocala, stunning example of classical architecture clad in Italian travertine marble. The 81,610-square-foot museum features 30,000 square feet of gallery space. Orange City park is a tremendous spot to observe manatees sheltering from the cold in the clear waters from November to March. Branford, rustic attraction on the Suwannee River with water slides, rope swings, docks, waterwheels, ladders: an old fashioned swimming hole. Kissimmee fleet of 12 airboats takes you on a wide variety of tours where you will see wildlife including water birds and alligators. This small village was established in 1895 by a spiritualist organization and is home to many mediums, psychics, and healers. The oldest 17th century fort in North America, this well preserved fort dominates the waterfront in downtown St. Augustine. Jacksonville non-profit sanctuary that gives big cats a permanent home. They have lions, tigers, pumas, leopards, lynxes and more. Cedar Key is on the Gulf of Mexico and was at one time a major Florida port at the end of the state's first railroad. This quaint village now loves tourists. There are many businesses in this town that will show you the hundreds of manatees that gather here and even let you get in the water and swim with the gentle creatures. Jacksonville. The Cummer has one of the finest permanent art collections in Florida, with nearly 5,000 objects. Bushnell. This park was established in 1921 to preserve the site of Dade’s Battle of 1835. Of 110 American soldiers, only 3 survived the ambush by Seminoles. It precipitated am awful war. Dakotah Vineyards and Winery is a family owned winery in Chiefland. Enjoy the rustic setting and sample some wine. Daytona Beach is home to the International Speedway and beaches you can drive on in your car. If you visit during other than the featured events, you can go on a first come-first served tour. 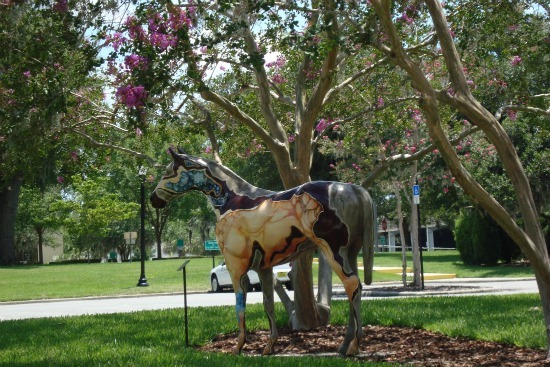 DeLand is home of Stetson University and is loaded with art galleries and good restaurants. Gainesville. You walk down a 232-step wooden staircase into the bottom of a geological formation that has been attracting visitors for well over a century. Orlando. Spend a day to two and this giant outdoor shopping, dining, and entertainment complex at Walt Disney World. Orlando 2-block Center includes the Walt Disney Theater, the Alexis & Jim Pugh Theater, the DeVos Family Room, the Seneff Arts Plaza, and many other spaces set aside for private events. Walt Disney World Resort. One of 4 theme parks at WDW, this is a park that celebrates human achievement in technology and culture. 1400 Broadway Blvd SE, Polk City, FL 33868. Tel: 863-984-3500. A display of more than 140 civilian and military planes and many of them can fly. Tours and learning about aviation history. Ocala 3 hours and 15 minute tour of working farms where you can go behind the scenes and chat with pros who work with thoroughbreds. St. Augustine hotel was built by railroad tycoon Henry Flagler in 1888 and is a National Historic Landmark.You can take a tour and explore. 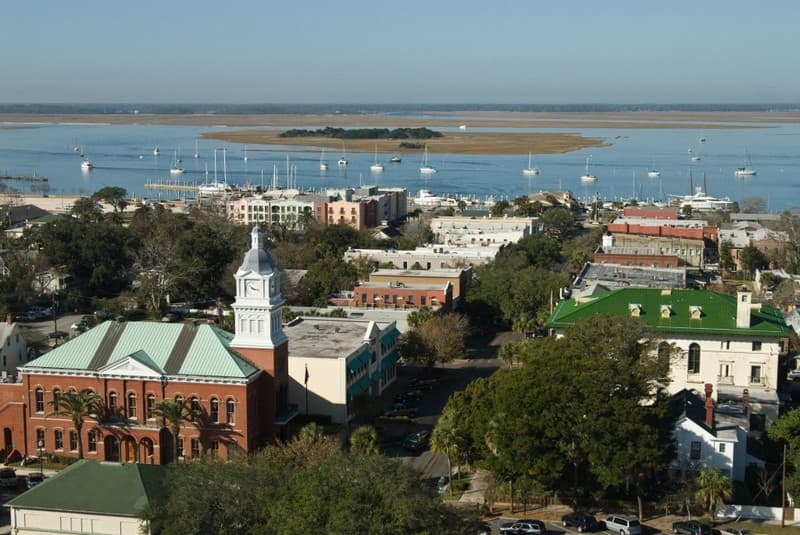 Fernandina Beach is a port city and one of the state's oldest. It has a lot of history, and old fort and great beaches. Flagler Beachfront Winery is north of Daytona and is a fun place to visit while you visit the great sand beaches. Florida Museum of Natural History is at the University of Florida, and has a huge collection of natural history items. Fernandina Beach park has 1,400 acres of natural beauty and a historic fort that sometimes has rangers dressed in period military uniforms. Orlando attraction on International Drive has 4 different go-kart tracks and 3 roller coasters, plus another 3 different thrill rides. Orlando, one of Florida's oldest attractions, it still entertains with thousands of alligators and a thrilling canopy ride. Ginnie Springs Outdoors is a privately owned campground that also has cottages and great canoeing, kayaking and diving. Super clear waters add to your enjoyment. Ichetucknee Springs State Park. A Florida tradition for years, floating down the clear cool river. A giant 400 foot tall observation tower in the form of a Ferris Wheel with separate enclosed air conditioned observation capsules. Jacksonville is one of the south's major cities and straddles the majestic St Johns River. 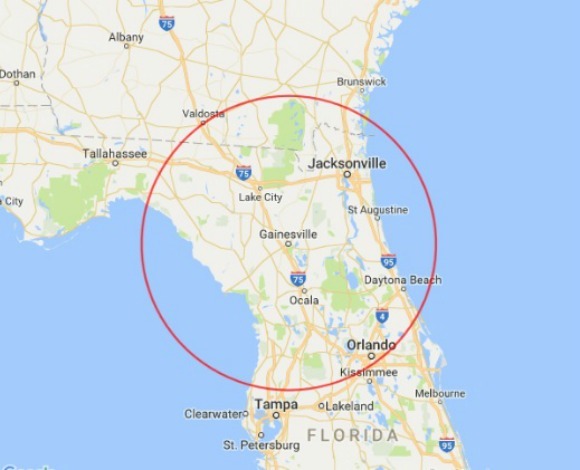 Jacksonville day trips is a page on this website that covers many of the destinations on this page and more. Interactive exhibits about your body's systems , energy exhibits, and animal encounters. Also a boat tour on the St. Johns River. This historic zoo is organized around several major exhibits. You will see dozens of exotic birds, crocodiles, antelopes, cheetahs, zebras, elephants, lions, monkeys, and you can feed a sting ray. Kanapaha Botanical Gardens is an unusual display of natural vegetation and trees in Gainesville. Jacksonville. Located on Fort George Island are the owner's house built about 1798 and the remains of 25 slave cabins. La Chua Trail, Paynes Prairie is a preserve where you might see horses, bison, wading birds, gators, and more. Lake City has many historic homes and buildings and is near some Civil War battlefields. 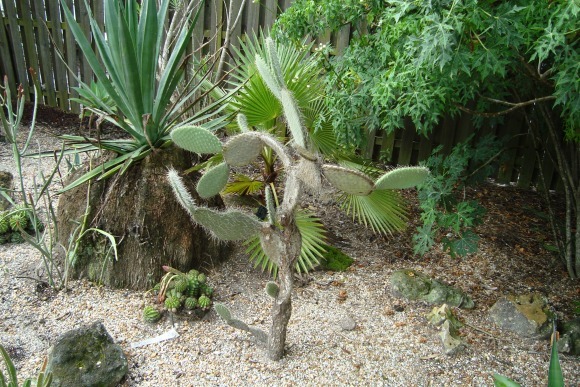 Leu Gardens in Orlando is one of the finest botanical gardens in Florida. Live Oak is a small Old Florida town with many historic buildings and homes. Log Cabin Winery is near Satsuma on the St Johns River and you can taste their wine and take a tour. Marineland was one of the earliest Florida tourist attractions that is now a dolphin research center. Mayo doesn't have a lot to see, but it is the hometown of Florida Gator folk hero Kerwin Bell. There is no clinic here; the Mayo Clinic is in Jacksonville. Madison is one of the oldest towns in north Florida and has done a good job of hanging onto many of its old buildings. Cross Creek. You will experience what 1930s farm life was like when the famous author lived and worked here. 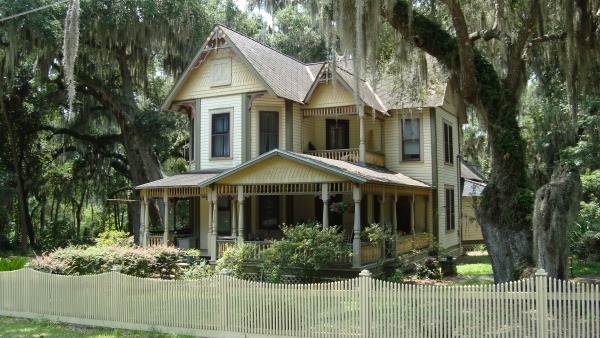 Her Florida Cracker style home and farm has been restored and is preserved. Orlando museum’s mission is to preserve, display, and interpret the permanent collection of paintings by Earl Cunningham, a folk artist who painted mostly coastal landscapes of America’s Atlantic Coast. Mount Dora is in rolling hill country on beautiful lakes and is one of the antique centers of the state. North Central Florida Day Trips is a page on this website that has maps showing several day trip driving routes in the area around Gainesville and the region. Alachua. Old horses wear out just like people. These horses used to pull carriages, support police forces, and just work. Here they can spend their senior years on a nice rolling horse farm. Ocala is a good sized city surrounded by thoroughbred horse farms and rolling pasture land. The Oldest House Museum Complex is located across from the historic National Guard building in downtown St. Augustine. Site of a significant Civil War battle. U.S. Colored troops took part in the battle. You can see exhibits and artifacts in the visitor center. Orange County Regional History Center. Orlando museum celebrates Central Florida history all the way from the first Native Americans to today's giant theme parks. Orlando is home to Florida's major theme parks, but also has many quiet and historic neighborhoods away from the noise. 777 E Princeton St, Orlando, FL 32803. Tel: 407-514-2000. It teaches science and makes sure kids have fun doing it. A large facility with 4 floors of science exhibits, giant screen movie theaters, and live programming, exhibit halls and science stations. Various city parks each feature ancient giant trees. It is a self guided tour and our website provides you with a map. Free. Ponce Inlet lighthouse is on an inlet south of Daytona Beach. You can climb to the top and see a fantastic view of the ocean and beaches. Princess Place Preserve is a historic lodge in a natural setting near Palm Coast. Dunnellon. At the park’s main entrance you can swim in the freshwater Rainbow River, rent canoes and kayaks, view waterfalls and gardens and enjoy a picnic area with grills, and pavilions. St Augustine is America's oldest continuously occupied city and has preserved many of its old buildings. St Augustine Alligator Farm is on the National Register of Historic Places. It is a Gainesville Florida day trip with gators galore and a zipline too. Steinhatchee is a fishing village on the Gulf of Mexico near the mouth of the Steinhatchee River. Stephen Foster Folk Culture Center State Park is a natural slice of Old Florida. It has many folk culture exhibits and is the setting every Memorial Day weekend for the Florida Folk Festival. Suwannee is a small fishing village near the mouth of the Suwannee River on the Gulf of Mexico. The Villages is a modern retirement community for active adults and has more than 60,000 golf carts rolling around. We also have a web page similar to Gainesville Florida day trips that focuses on trips from here. University of Florida is home of the Fightin Gators and was once the largest university in the state. Walt Disney World is on everybody's list of places to visit while in Florida. There are 4 theme parks for you to visit. Whispering Oaks Winery is near the Villages and specializes in wines made from blueberries.